It might only be February, but 2011 has already been a busy year for Emily Blunt. With animated flick Gnomeo and Juliet under her belt, the actress is hot on the publicity trail for hot new action movie The Adjustment Bureau. We bagged an exclusive interview with the actress, who told us all about working with Matt Damon, playing a ballet dancer and what she makes of the love story. SEE EMILY’S STYLE HISTORY HERE! Action packed, with a romance in between The Adjustment Bureau, which tells the tale of politician David Norris who accidentally glimpses the future Fate has mapped out for him. But when David falls for contemporary ballet dancer Elise (Emily Blunt), he finds out the love story is not in his Plan. Instead he must risk everything, and go up against the men of The Adjustment Bureau who will do everything in their power to stop them being together. WATCH MC’s exclusive interview with Emily, here…. Directed by George Nolfi, writer of Ocean’s Twelve and The Minority Report, we guarantee it’ll have you on the edge of your seat. 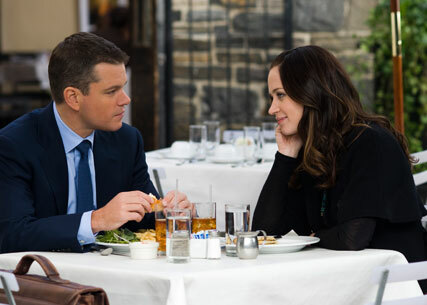 The Adjustment Bureau hits screens on March 4th.